Our flag is represented here as a symbol of our common strength and bare-knuckled resilience as a nation. Its worn and weathered appearance is telling of the challenges we face from external threat and internal decay – forces, we as a people, work against every day. 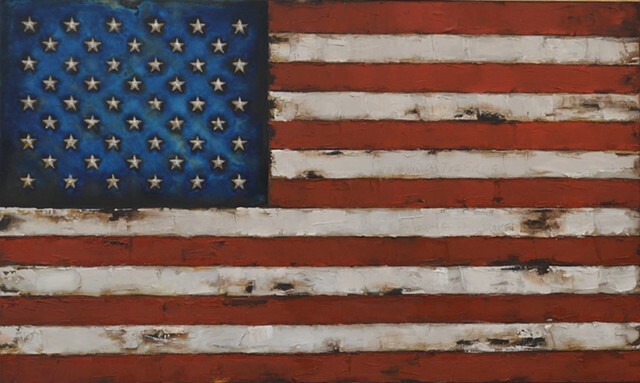 Inspired by the flag that flew over Ft. McHenry during the battle there in 1814, it was the sight of the flag the morning after the battle that motivated Francis Scott Key to write the words that became our national anthem. The work is placed in honor of our U.S. military Veterans past and present and their families. It is also here in honor of our Allies abroad, our interagency partners, and our local ‘first responders’ with whom we shoulder risk and peril in pursuit of common human ideals of liberty and justice. The original painting was dedicated to our teachers. Committed men and women who are tireless in their work preparing our next generation of Americans and global citizens. In challenging times the sight of our flag has served as a source of confidence and courage. It is hoped that it serves that purpose here.